Home / Full-time / Tensa Indoor? Most people looking for portable hammock stands are interested in camping. But why limit it? All the recent advances in hammock camping comfort and popularity have more people embracing hammocks as full-time beds, as people in the American tropics have for centuries. Hanging hammocks indoors requires more expertise, commitment, or permission than many people can bring to the task. Placing wall hooks is clean and simple in some cases, but difficult, dangerous, or impossible in others. Meanwhile, stands suitable for indoor use tend either to have huge footprints, or else put their supports far too low or close to support full-size sleeping hammocks far enough off the floor for ease of entry, sitting, and exit. If a stand’s hanging points aren’t at least about 72 inches high and 132 inches apart (6′, 11′; 1.8M, 3.3M), it’s just too small for a compelling adult bed replacement. That’s just about every one available cheap on Amazon, at Walmart, etc. It’s almost as if they think hammocks are just for lounging! Our Tensa4 stand fits in the footprint of a twin bed with room left over, the high ends being wider. Apart from its portability packed, this means it deploys where no other stand we know of will. 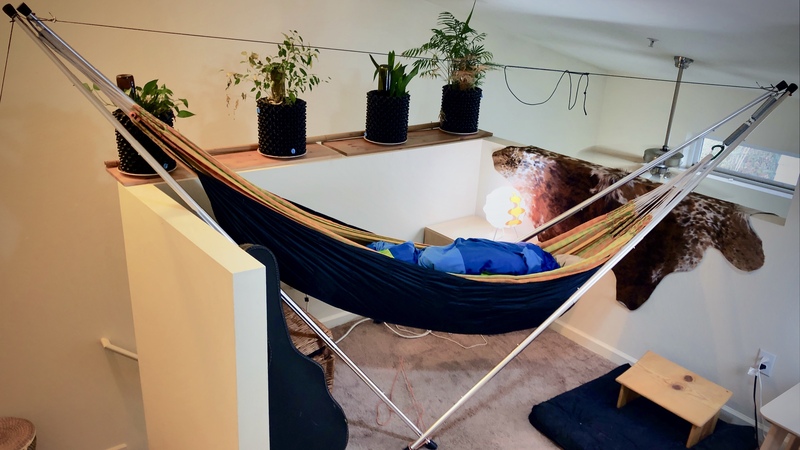 Shown in the photo is a 12′ Colombian cotton hammock with underquilt for Oregon’s cool climate, hung properly with foot end higher than head for flattest lay, another detail most stands don’t accommodate. It’s far more comfortable than any mattress costing several times as much as stand and hammock together. Unlike a mattress, it’s free of organohalogen flame retardants, formaldehyde and other volatile organic compounds, and doesn’t contribute to the problem of about 20 million of them annually clogging up landfills after they become too disgusting. That’s right: a hammock can be cleansed of mites, mildew, and bodily fluid stains, unlike even the lumpiest vegan organic cotton futon. But mainly, the sleep is heavenly. Experience and science align. Tensa Outdoor will continue to advance the best stands for camping, while sidestepping toward the ultimately more meaningful goal of packaging a compelling mattress alternative, for the third of your life you spend in bed. Very impressive Todd. I mean, WOW! Even if I were not your mother, I’d be impressed. I found the history quite interesting and the videos entertaining and informative. Suggestions for anchoring indoors would be helpful. I use the tensa4 in hotels every week and the best I’ve been able to figure out are the hinges on door frames, which are usually quite heavy in a hotel. I tried to reproduce the tensa4 on top of a bed but just couldn’t figure out how to anchor. Anchors should be able to bear about half your body weight. A third can do in a pinch, and more is never a bad idea. On top of the bed, you can anchor to the bed frame, as your own weight holds it down. Door and cabinet hinges, door stoppers, hand rails, HVAC grates or radiators work. Anchor point can be high as well as low: look up. Tying to a shoe, key-fob, or similar and shutting it behind a window or latching/locking door, drawer or similar can work. A small screw hook can pass through carpet into wood floorboard, leaving no mark when removed. If none of the above, two collapsible 5-gallon water vessels placed directly under the foot end apex are highly portable when empty.